PocketBook SURFpad ― is a true catch for those living online. You will always be able to communicate in social networks, watch online videos, read recent news and find all the necessary information or shop in a snap! Pocketbook SURFpad has loads of applications, services and entertaining content predefined. In addition, it will become your reliable assistant at work: a complete package of office applications and mail clients will help you deal with all your daily tasks brilliantly! A 7 inch, multi-touch display will allow you to easily navigate through the screens with pleasure. A Conventional screen, ideally displaying both Internet web-pages and large format video in your standard format which displays on your large screen computer. A Built-in gyro sensor rotates the screen automatically when you change your device position whether it’s a 90°, 180° or a 270° orientation. PocketBook SURFpad is an all-in-one tablet. The user interface and layout is magnified with the help of multisensor controls to provide you with the most user-friendly experience. The touch screen sensitivity will enable a fast and effective use of the device features with each touch. The device is based on Android 4.0.4 which ensures fast performance, large set of applications and easy-configurable synchronization over cloud services. 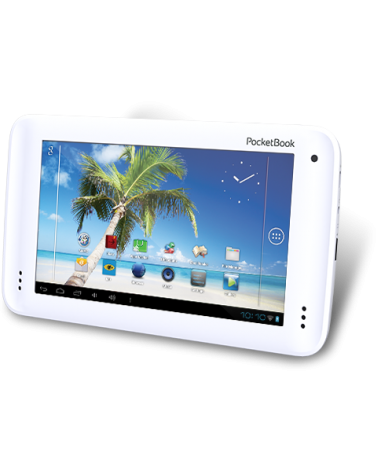 PocketBook SURFpad model is differentiated by its multiple formats support which is common for all PocketBook devices. It supports 10 video formats - ASF, MKV, AVI, MP4, FLV, WEBM, 3GP, MOV, MPG, WMV, 5 audio formats - MP3, WMA, AAC, OGG, MIDI, 10 text formats - EPUB, PDF, FB2, FB2.ZIP, TXT, HTM, HTML, DOC, DOCX, RTF, as well as 4 graphic formats - JPEG, BMP, PNG, GIF. Moreover, customized applications were added from PocketBook SURFpad device designer – PocketBook Company. PocketBook SURFpad is designed for your everyday use. Starting from it’s thin, lightweight and ergonomic design and ending in the position of audio speakers and front camera. All the components of this model are focused on producing the most convenient usage whether it’s to easily surf the web or watch a full-screen video. It weighs only 285 g which means that it can always be easily carried with you. You won`t notice the extra luggage, but you will definitely feel the difference having it! PocketBook SURFpad is based on a 1GHz Cortex A8 processor supported with a 512 MB RAM, providing a fast-paced environment necessary for multifunctional applications to work effectively. Watching pictures and videos, listening to music, surfing the Internet and reading books – now you can simultaneously do all that and more with PocketBook SURFpad. PocketBook SURFpad model contains a built-in 4 GB Flash memory as well as an external microSD slot that can be expandable up to 32 GB*. Internet connection is available via a Wi-Fi 802.11 (b/g/n) built-in antenna in PocketBook SURFpad model. There is Office Suite Pro v.6 installed in order to work with office applications on PocketBook SURFpad. It is a set for proofreading of electronic office documents and comfortable viewing of PDF-documents. You may also use the embedded CoolReader application to read e-books with a huge number of new and exciting features that will elevate your reading experience into new horizons. - 6,5 hours non-stop video playback.